As hard as starting the manuscript for a novel is, finishing is often harder. While I repeatedly tell those that I mentor that it’s the writing itself that makes them writers, it’s only finishing that will make them novelists. And crossing the finish line isn’t easy for any us. The second novel of my Genie Chronicles series took me an interminable amount of time to write. An unforgivable amount of time were I with another press maybe. I’ve learned to finish the hard way. Stop it right now! As tempting as it may be latch onto a dazzling new story idea and disappear down another rabbit hole with it, don’t do it. Keep making notes on any ideas that you want to refer back to at a later date, but make a promise to yourself that you won’t start any new projects until you’ve completed at least one of your WIPs. If you have multiple writing projects going on but nothing’s getting finished, it’s time to determine which of these WIPs are worth completing and which aren’t. Ask yourself which story you believe in most. Which is eating away at you to be told? Perhaps that novel you started in high school or college isn’t the one you should be writing now. Like everyone else, writers grow and evolve. Make sure you’re writing the story only you can tell. Separate active projects that still excite you from the dead ones you’re willing to part with and any you think you’d rather set aside to revisit sometime in the future. Just one—because something has to be your priority or nothing’s getting done! This doesn’t mean you can’t work on a side project when you need a break from the world and characters of your Priority WIP, but it does mean that any time and energy you devote to that other project will come after you’ve committed the lion’s share to your Priority WIP. If you’ve made any commitments to agents, publishers, or readers, those committed to projects must absolutely come first. Choose a single project as your priority—one that you will cross the finish line with! Nothing motivates me to write more than a reader asking when my next book will be available. A few months after the release of my first, Heir to the Lamp, when the initial hubbub (mostly from people I know) had died away, it was easy to forget that I had a legitimate readership waiting for more of my genie story, not to mention a publisher to whom I’d promised additional books. With the inevitable writer’s block, technological malfunctions, social media, a family and Netflix all clamoring for a writer’s attention, it can be difficult to hammer out a blog post some weeks much less devote hours to an entire novel, but if you’re serious about finishing your manuscript, you’ll make it work. Being accountable to my publisher World Weaver Press, my local writers’ group, and writers/readers I’m fortunate enough to get to interact with at conferences helped me finish Solomon’s Bell and launch headlong into the third book in the series, The Island of Antirrhodos. Be accountable to those you’ve told a finished novel is in your near future. I promise—they’re cheering you on! Before the experience of my second book, I would have rather been beaten than complete an outline for a WIP. I thought they were too restrictive and stifled creativity. I was wrong. Having an outline means having a plan for where your novel is going. Of utmost importance is knowing how your story will end. Know your ending and use an outline to write to it. Making corrections isn’t writing. Research isn’t writing. Revising and tinkering aren’t writing. If you spend all of your time editing, researching and revising, you can’t finish your novel. You won’t finish this way. This realization was the hardest for me to come to as a writer. A friend and fellow writer posts her daily word count goals and successes to social media. Watching her make and achieve those goals goes a long way in encouraging me that I can do it, too. Television, social media, the chaos of a home with children (sometimes literally) bursting through the drywall: these are all distractions I wrestle with (sometimes literally) on a daily basis. While it’s important to be willing to take advantage of the opportunity to write anytime and anywhere that opportunity presents itself, we’re all susceptible to distraction and it’s helpful to take measures that enable us to make the most of the writing time we have available to us. When I’m focused on a WIP—and I mean really focused and ready to commit, commit, commit—I turn off the television and my cell phone at the very least, and leave home for quieter surroundings when it’s absolutely necessary. If something happens that pulls me away or irreparably breaks my concentration, I try taking a quick walk or completing some small task like folding a load of laundry while I mentally act out a bit of action or dialogue from the story until I’m refocused. Those are things that work for me. Identify what distracts you from your WIP and take steps to at least temporarily remove those distractions. your story has a beginning, middle, and end? you’ve written 65,000 words and proofread them? you’ve shared the work with a writers’ group, beta readers, or critique group and revised it? “Finished” can mean any or all of those things. Obviously a manuscript you plan to self-publish versus one you plan to query may be considered “finished” using different criteria. Without a clear definition of “finished” you risk your project going on and on forever. It’s been over a week since I sent in my revised draft of Solomon’s Bell and I know without a doubt that were it not for clear parameters I set for myself concerning the “finished” manuscript, I’d still be revising and editing today—even though the time for all of that will come in the publisher’s editing phase over the next few months, I would have kept doing it over and over again before sending it on had I let myself. 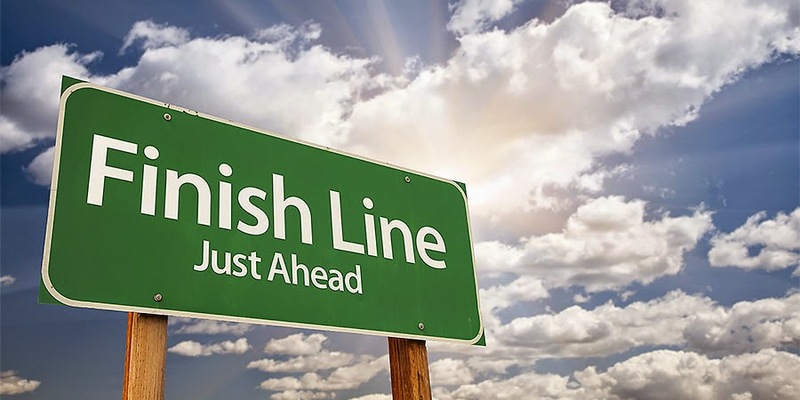 Decide what you want your manuscript to look like when you cross the finish line with it and work toward that product. You’re writing a novel—accomplishing something relatively few people ever accomplish! Reward yourself for hitting those milestones in Step #5 with something positive, something you love to do and gives you joy. Time away from the work that is writing can serve as a much needed escape and allow for the recharging your mind needs to keep going. For me it may be an episode of Game of Thrones or Orange is the New Black when I’ve finished a chapter; an afternoon at the zoo with my husband and kids or dinner at a restaurant when I’ve completed a major section; a gathering with family to toast the acceptance of the manuscript for publication. Some writers can bang out a novel and race toward the finish line in a matter of weeks, but for the majority of us it’s a long and arduous journey. Be kind to yourself along the way. Do you have other writing tips that have helped you finish a project? I'd love for you to comment with them below. Happy writing! See you at the finish line!